The Met Office forecast was wet, for once they were wrong, but we did not complain, it only meant that we were kitted like our route was to be in the North Sea. We had a fair turn out at Low Bridge, including Terry W guesting from South Yorkshire “one of our friends electric”, an old song, but useful for pushing the wind for us. With an eye on the good weather, blow the forecast, a quick consultation with Colin Pugh suggested that a North Easterly direct might be best. So first caffeine stop was Morrison`s cafe, to get us all in and served quickly and not waste any of this good weather (see photos). Away went the “A” team towards Thirsk. The “B” team headed for Thornton Bridge and Brafferton, Nick heading for home being on Grandad duty. 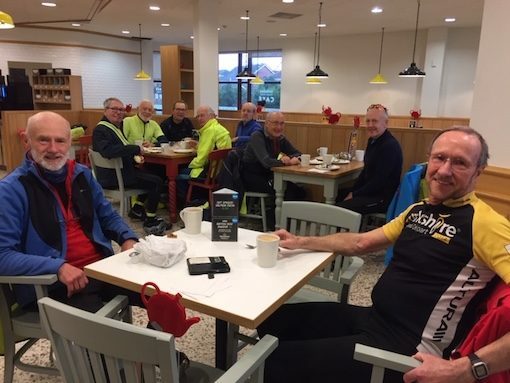 Bill W, Dave P Norman and Terry W continued to Flawith and Aldwark Village and in to Great Ouseburn for hot drinks at the Village Post Office. Then on to Arkendale and Ferrensby and a cheerio to Terry W who headed for Low Bridge, Bill, Dave P and Norman it was up the Beryl Burton track and home. Still with sun and some blue sky, though roads looked wet in Harrogate but we missed it. We were missing quite a number of our usual mates this morning. Was it the weather forecast? Was it something we said? (Actually, if you can’t stand a good dose of mickey taking, you’re in the wrong cycling group anyway). Was it that they had all left the country after last nights performance down London way? 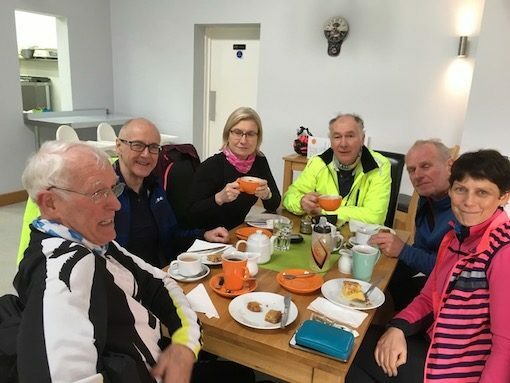 In any case our quorum of six pressed on ahead, after the compulsory coffee stop at Morries (see above) in Boroughbridge, in the Thirsk direction. DaveW peeled off at Asenby in order to meet his deadline, whilst we made good progress to beans on toast (four beans grade) at Arabica in Thirsk Market Place. A few World Class issues were aired, and solved in the customary EG quick style, but the B word hardly got a look at the Agenda sheet. We thought that the return journey would be a breeze, that is, downwind, but we all recognise the first law of cycling, and it was definitely in evidence again this afternoon. No matter, one of our statistician members announced that we had achieved the magic 15mph average over the day, and we immediately felt obliged to dive into Morries again, for celebration purposes. There wasn’t much bubbly in sight, but we all had a cup of tea. It was then that the B word finally reached the top of the list. Sad to say, and just like that lot in Westminster, we did not have a solution, just loads of stuff we didn’t want. So you see, our government does represent us. A fairly quick blast back to Knaresborough completed an excellent day. Thanks to Eric, PeterB, DaveW, Geoff and Colin; about 50M covered . Also discovered that my new waterproof works; it promised in the sales blurb that I would not get wet whilst wearing it. Well…..I didn’t. DaveS. I’m going to become a weather forecaster. I’m sure I could do a better job than the people who made today’s forecasts. The only bit they got right was that it would get colder during the day. The anticipated rain (which kept so many away) never happened. We had a great and eventful ride in good weather with great views as always. We set off in 2 groups – 6 in the fast group and 9 in my slightly slower group. The first stop was at Clint Bank for Liz P whose Garmin came loose. Mike W came to the rescue – good to see you again Mike. Then through Birstwith towards the Toll Bridge where we met the fast group with Collette’s bike in pieces. Her jacket had come out of her saddle bag and wrapped itself around every bit of the bike you could think of. Again, Mike to the rescue. The bike was OK but we’re not sure about the jacket. Collette was still smiling when we met her later at G&T’s. After passing Brimham Rocks we hit the main road and cut through to Sawley and then to G&T’s where I remembered to take photos. After lunch I took my group down the lovely little lane from Sawley towards Fountains where Anne (with or without an E) had a puncture. Peter to the rescue this time. The fast group followed the official route 177 back to Ripley. The ride home was uneventful. 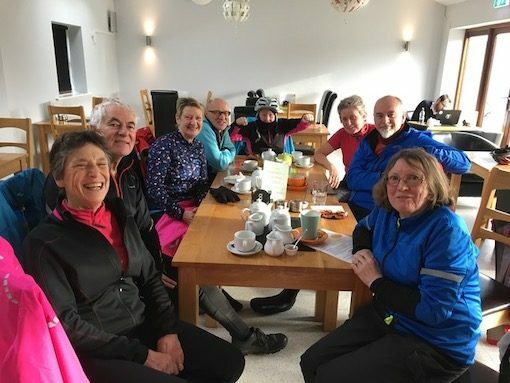 Thanks to some pre-planning the previous day, today’s nominal ride leader was able to catch up with the five others who had set off from Hornbeam on a long ride to a previously unused destination cafe at Sherburn Aero Club (aka digby’s). A pranged BMW with Police traffic control at the Arthington turn at Harewood caused a 40 minute delay for Harrogate bound travellers today but, thanks to the miracle of mobiles, a delayed meet was arranged in Kirkby Overblow and all was well. With a tail breeze our progress to Bramham via Linton and Collingham was on the swift side and despite the momentary loss of Lesley we arrived at Sherburn Aero Club just before 12.00. 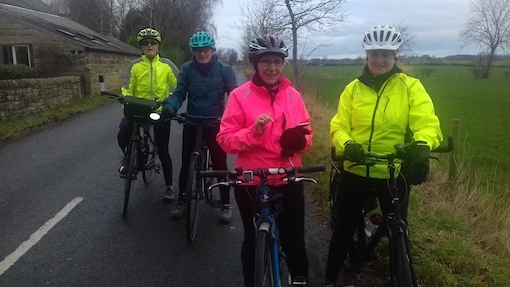 Here we were greeted with the beaming face of Angela who, despite completing her Gran Fondo Challenge the previous day (100km ride in a day in Jan) had ridden direct from home near Leeds to join us – another triumph for a pre-circulated ride route. A former member and pupil at the Aero Club, Angela was clearly at home and I think said hello to someone she knew. The menu at Digby’s is limited but low-priced and perfectly adequate for chilled hungry cyclists, who had the place to themselves, largely. We stayed almost an hour, a combination of the good food and the chill outside. It will certainly go my list as a place to revisit and provides a welcome oasis in the Sherburn cafe desert. The return leg of the ride became a question of how long we could put off the inevitable turn into the westerly breeze/wind. Luckily the route provided plenty of tacking manoeuvres as we made our way north through Biggin, Ryther, Ulleskelf, Stutton, Rudgate and Boston Spa to Wetherby Racecourse. By this time the sun had broken through to give a last couple of hours of pleasant cycling conditions where fingers were not constantly nagging us to stop. Lesly and Richard had earlier diverted to Bramham and Graham left us at Wetherby to continue on the official route home, while the remaining four headed back to Kirkby Overblow, retracing the morning’s ride. 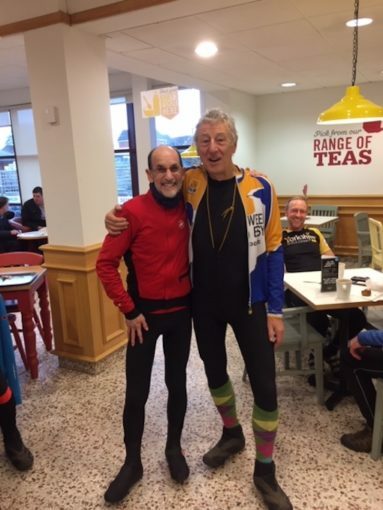 Here, Richard L and Trefor carried on to Pannal and HG while Angela and Terry piled bikes and selves into the C3 for a ride back home to Leeds. Another January bonus mileage in excess of 60 for those who did the whole thing, mid 50s for those who started elsewhere. My personal thanks go to the group who saved my day from being a solo thrash and to Tesco Mobile who did their bit also. 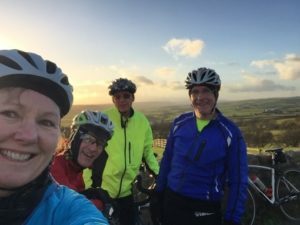 As temperatures are due to plummet in the next week, we may need to savour the past couple of Wednesday Long Rides for the bonuses they have been; more next week, but who knows!